Last year, Finance Minister Bill Morneau declared that multiple career changes and “job churn” was the new reality that Canadians would have to get used to. This new norm of unstable work environments is often called “precarious employment”. According to the International Labour Organization, precarious employment indicates a lack of protection or inadequacy of rights at work. It appears in both informal and formal jobs, including self-employment, involuntary part-time, nonstandard, contract, or interim work. In Canada, precarious work has become so prevalent, many researchers identify it as a new form of employment in our labour market; a 2014 study conducted by Statistics Canada found that nearly one-third of the Canadian working population were in unstable employment situations. A similar report the year prior from United Way found that 52% workers in the Greater Toronto Area and Hamilton held temporary contract or part-time jobs. So, if precarious work is the new norm – why is that a problem? An environment of precarious jobs is one of uncertainty and instability. 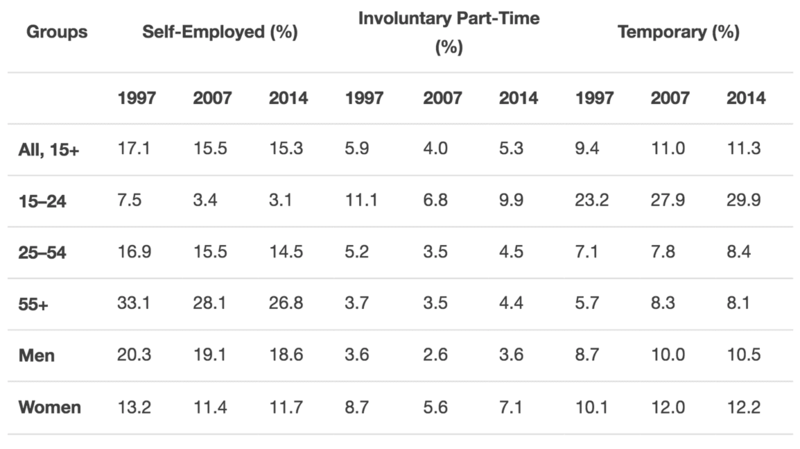 When people do part-time, temporary, or contract work, they are significantly less likely to have access to benefits, paid leave, or pensions – leading to more uncertainty around retirement. Workers in precarious employment are twice as likely as those in stable employment to have mental health problems, six times more likely to delay forming a relationship because of job insecurity, and three times more likely to put off starting a family. Precarious employment is also linked to income insecurity – a major cause of social stress and fatigue. Considering that income is a primary determinant of health, a lack of income security increases overall stress, anxiety, and depression. Precarious employment is certainly not a new phenomenon, but rates are not improving. The millennial generation has the largest percentage of people with post-secondary education and experience, yet they cannot secure employment. As a generation, they are highly educated, diverse, and adaptable. However, their significant investment of time and money into their futures often results in temporary or unstable work with limited prospects for financial security. The trend towards young people working in unstable jobs demonstrates a larger, structural problem occurring in Canada. As job precarity becomes more visible, the government has taken some action on it, such as encouraging private-sector companies to create group pension plans and to expand employment insurance (EI), allocating special benefits to those who are self-employed, and adapting the temporary foreign worker program in attempts to better protect vulnerable groups. As much as “job creation” is a cornerstone of a strong economy, it falls short when only precarious jobs are created – jobs that do not provide a decent wage, sick or compassionate leave, pensions, or benefits. Currently, only 2% of workers under the age of 20 and 9% of workers between the ages of 20-24 have workplace pensions. Simply having a job is no longer enough in an economy where it is possible to work full-time at minimum wage and still live in poverty. 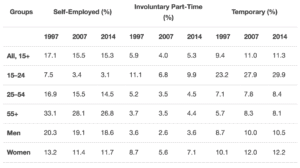 What needs to happen to fix this precarious work trend? To address job precarity and stem growing income inequality, we need a plan. We need a plan that reinforces an economy which values workers as much as work. We need a plan that includes policy change, legislative support, and protection ingrained in a human rights framework. We have that plan. In 2015, Dignity for All launched its model anti-poverty plan as a tool to strengthen the development of policies at the national and provincial/territorial levels to eradicate poverty, food insecurity, and homelessness. With the Canadian Poverty Reduction Strategy in development, it is time to look to the federal government’s human rights obligations to address the needs of Canadian workers and make sure the next generation of workers have a future to look forward to. You can add your voice to the Canadian Poverty Reduction Strategy by engaging in the consultation process. The Dignity for All website has tools to help you have your say. Claudia Langevin is a Placement Student at Canada Without Poverty in the Carleton Bachelor of Social Work program. This blog is cross-posted on the Dignity for All campaign site.